Dealing with the most traumatic event any parent can endure--the death of a child--David Lindsay-Abaire manages to involve his audience in the grieving process and illustrate how we all grieve differently and for different lengths of time. 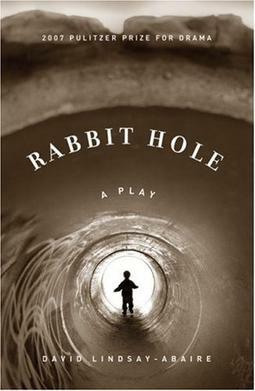 Despite the subject matter, this 2007 Pulitzer Prize-winning play is often extremely funny, setting up emotional contrasts between ironic humor and infinite sadness which make the loss of the child more poignant, without dissolving into bathos. Danny, a four-year-old chasing his dog, has been struck and killed by a car driven by a seventeen-year-old driver, and the family is trying to cope with their grief. As the play opens, Becca, the child's mother, is folding the laundry--Danny's clothes--which she has just washed in preparation for giving them away. She has internalized her feelings, refusing group therapy, any religious counseling, and especially the advice of her overbearing mother. Her husband Howie goes to work, attends group therapy, becomes friends with some of the other grieving parents, and tries to coax Becca into becoming a wife again. Among the other characters, Nat, Becca's mother, has all the pat answers, and she equates the loss of this child with her own loss of her adult son, something she insists on emphasizing to Becca. Izzy, Becca's sister, an off-the-wall case of arrested development, has been having an affair and is now pregnant, an eventuality with which Becca must now learn to cope, especially since Izzy has used Danny's death as an excuse for her irresponsible behavior. Jason, the seventeen-year-old driver of the car, is also trying to come to grips with the events, blaming himself, reliving every moment, searching for some sort of forgiveness which he is not sure he deserves.